Joints are the area where two or more bones meet. Here, bone is surrounded by a type of connective tissue called articular cartilage, which helps to reduce the friction on the bone created by movement. A tissue called the synovial membrane, or synovium, lines the joint and seals it into a joint capsule. The synovial membrane secretes synovial fluid (a clear, sticky fluid) around the joint to lubricate it. The joint capsule is surrounded by ligaments and tendons (other types of connective tissue) that connect to muscle and control movement of the joint. Arthritis is a general term that refers to inflammation in joints. There are over 100 different forms of arthritis that can occur in men and women of all ages, affecting different parts of the joint. Some forms are the result of injury, disease or infection, and the inflammation goes away upon resolution of the underlying problem. However, in some injuries and diseases, the inflammation does not go away and the symptoms can worsen, indicative of chronic arthritis. Rheumatoid arthritis is another common type of chronic arthritis, as well as one of the most prominent autoimmune disorders in the United States.4 Unlike the damage created by physical stress on the articular cartilage that is characteristic of osteoarthritis, rheumatoid arthritis affects the synovial membrane lining the joints, causing painful swelling and inflammation. Synovial cells secrete cytokine inflammatory markers into the synovial fluid, which then recruit additional immune molecules and cells such as T-cells and macrophages (white blood cells). These immune cells initiate the process of cartilage and bone breakdown that eventually result in joint deformity. While joint inflammation is the cornerstone issue of arthritis, the causes and risk factors differ between osteoarthritis and rheumatoid arthritis. Rheumatoid arthritis occurs when the immune system attacks the synovial membrane. The exact cause of this autoimmune reaction is unknown; however it is believed to be a combination of genetic and environmental factors. Genetically, those with rheumatoid arthritis seem to be more susceptible to environmental influences rather than inherit the disease directly, but it can still be seen running in families. Environmental factors include triggers such as viral or bacterial infections that alter the immune system. Aging and cigarette smoking can also increase risk of contracting rheumatoid arthritis. 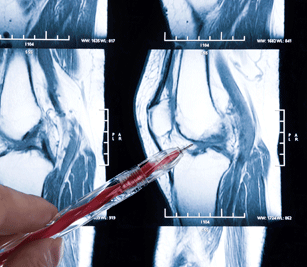 In osteoarthritis, symptoms often develop slowly and worsen over time. Cartilage can eventually wear down completely, leaving bone rubbing on bone, damaging them and increasing pain. Bone spurs, or small bony growths, can also form around the affected joint. In rheumatoid arthritis, everyone can be affected differently, but symptoms usually begin to affect the small joints in the hands and feet. As the disease progresses, larger joints like the knees, shoulders and elbows can also become involved. Symptoms often tend to alternate between periods of flare-ups when they worsen and remission when inflammation and pain disappear. Another concern with rheumatoid arthritis is the presence of non-degrading fibrin deposits within the synovial membrane which may aggravate inflammation and work systemically to form nodules on joints and other parts of the body.6 Additional symptoms include fever, fatigue and weight loss. Neither osteoarthritis nor rheumatoid arthritis can be completely cured. The goal of chronic arthritis conditions like these involves controlling pain and inflammation while reducing further joint damage. When symptoms worsen, damage, pain and stiffness can make it more difficult to go about daily activities. Disfigurement can occur with unattended arthritis symptoms. Rheumatoid arthritis also occasionally affects the skin, eyes, lungs, heart, blood or nerves. Arthritis treatment varies from person to person, depending on the cause, amount of damage to the joints, and how it affects daily activities. In the most severe cases, joint replacement surgery may be necessary. In most other cases, treatment focuses on reducing pain and inflammation while preventing further damage. 1. Lawrence RC, Felson DT, Helmick CG, et al. Estimates of the Prevalence of Arthritis and Other Rheumatic Conditions in the United States. Arthritis Rheum. 2008; 58(1):26–35. 2. Fernandes JC, Martel-Pelletier J, Pelletier JP. The role of cytokines in osteoarthritis pathophysiology. Biorheology. 2002; 39(1-2):237-246. 3. Bonnet CS, Walsh DA. Osteoarthritis, angiogenesis and inflammation. Rheumatology. 2005; 44(1):7-16. 4. Jacobson DL, Gange SJ, Rose NR, et al. Epidemiology and Estimated Population Burden of Selected Autoimmune Diseases in the United States. Clin Immunol Immunopath. 1997; 84(3)223-243. 5. Arend WP. Physiology of cytokine pathways in rheumatoid arthritis. Arth Care Research. 2001; 45(1):101-106. 6. Dizon FJ, Kunkel HG. Advances in Immunology. Academic Press. 1973; 16:265-327.